Travel 2.7 miles west on Airport Road (NC 280). Turn left onto Butler Bridge Road at the traffic light. Oren Drive is 300 feet on the right and the church is on the left at the top of the hill. Visitor parking is available near the main entrance. Travel 0.5 miles north on Hendersonville Road (U.S. 25). Turn left onto Butler Bridge Road at the traffic light. Oren Drive is 2.5 miles on the left, just before the intersection with Airport Road (NC 280). The church is on the left at the top of the hill. Visitor parking is available near the main entrance. 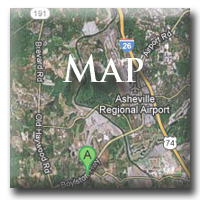 Travel north on Asheville Highway/Boylston Highway (NC 280) through Mills River. Turn right onto Butler Bridge Road at the traffic light. Oren Drive is 300 feet on the right and the church is on the left at the top of the hill. Visitor parking is available near the main entrance.